If you want to know how the world sees God, go and see The Tree of Life. 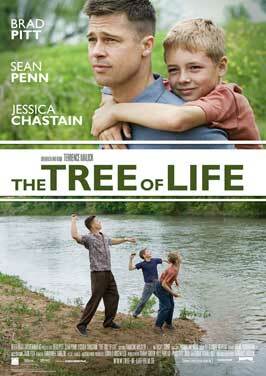 The film, by Terrence Malick, begins with the death of one of 3 sons in a family. The perennial questions of ‘how could a good God allow this?’ seem for a while to be pushed to one side, as we are taken back to the children’s births and watch their life story – set in 1950s America – unfold. The father, played superbly by Brad Pitt, appears benevolent at first, but it is not long before his behaviour becomes more and more erratic and it is clear that his oldest son, Jack, is as best wary of him. I’m not sure at what point it occurred to me that Pitt’s character was very reminiscent of many people’s view of God, but once I’d spotted it, the similarities grew and grew. – His children were afraid of him, and would often be severely reprimanded out of the blue for minor misdemeanors. – He demanded both their respect – asking them to call him ‘Father’ and ‘Sir’, never ‘Dad’ – and their expressions of love. – He was capricious; sometimes fun and loving, sometimes harsh and unyielding. Many people see God as a capricious bully. He’s someone who commands ‘Thou shalt not kill’ then a few chapters later orders the slaughter of entire people groups. He gives and he takes away, and asks us to respond by saying ‘blessed be the name of the Lord’. He doesn’t seem to be good, yet he requires goodness of us, and with no apparent reward. It is a confusing way to live, and it is no surprise when Jack begins to bully others and answer back to his mother (who is loving, gentle and kind, and torn apart by her husband’s behaviour – is it stretching things too far to see her as the representation of Jesus? She’s an advocate and a mediator, but ultimately on the father’s ‘side’… If you’ve seen the film, let me know what you think!). It’s a depressing picture, and no wonder that people are hesitant about following a God who conforms to this image. Secondly, the family don’t lose their faith. They wrestle with how to love a God whom they don’t understand and therefore struggle to respect or trust, yet their response is not to dismiss his existence, but to keep struggling. And it maintains throughout this perception of God; he is mighty beyond our understanding, and though we struggle to comprehend his ways, ultimately he is not a human father. His mysteries are not flaws but wonders. The film is quite long, and arty, with some rather bizarre sequences showing the beginning of the world, but if you can get past that, it’s an excellent tool for raising some difficult, but crucial questions. *With thanks to Douglas Adams/Oolon Colluphid for the title. I definitely want to check out this movie! Thanks Jeremiah. I’d seen mixed reviews so was not sure what to expect, but I loved it – as you can tell! Would love to hear your thoughts when you see it.